I’m learning to bake through the power of Internet bloggery. The gist is, every Tuesday I will post about a different baked good from Baking: From My Home To Yours by Dorie Greenspan. This is all part of the wonderful Tuesdays With Dorie blogroll. You’ll see my disasters and far-less-frequent triumphs at the oven. 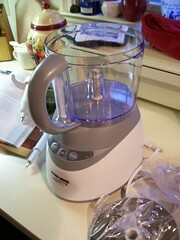 I started out by picking up a few kitchen items I didn’t own–namely a food processor and a pie plate. My parents have all of this stuff, but I’m imagining someday I’ll be gainfully employed, out of the house, and in need my own versions. As that annoying guy from Rage Against the Machine says, “What better place than here? What better time than now?” I get most of my baking advice from Rage Against the Machine, by the way. With a pocket full of shells. I didn’t see any 9″ pie plates at Target (which was the extent of my lazy shopping), but a 9.5″ pie plate would fit the bill just fine, right? RIGHT? I had some free time while my girlfriend was driving into town, so I made the crust on Thursday evening. Pretty simple ingredients–vegetable shortening, butter, flour, sugar, salt, water. Food process the beast, wrap it, and stick it in the refrigerator. Easy peasy. I was given a little boost in confidence when my dough actually came out looking like dough. Is this baking? Baking is easy. All of those Keebler elves need to stop their bitching, because they are living the life of kings! After refrigerating the dough during a dinner date, I came back and rolled it. The recipe had a suggestion of freezing the dough into the pie plate, and that appealed to me. That way all I’d have to do was fill the crust and bake. Simple stuff. Here’s where my stupid, oversized pie plate came into play. Apparently 0.5″ is a lot of room when it comes to pies, you see. I was supposed to have a fair amount of overhang with my crust, but my crust barely came up to the top of the plate. I tried to make up for it by squeezing the crust a little thinner, but how thin is too thin? Something told me that having a nearly translucent layer of pie crust holding a pound of sugary-sweet blueberry goo wouldn’t exactly work out. Furthermore, the second half of the dough (the top of the pie) probably wasn’t big enough to drape atop the pie. All the same, I didn’t have the time or ingredients to make another crust, so it would have to do. I froze my crust and went on to do weekend things with weekend people, fancy-free of all the pie woes that would later befall me. Flash forward to Monday evening, where I was free to pie the pie that must be pied. 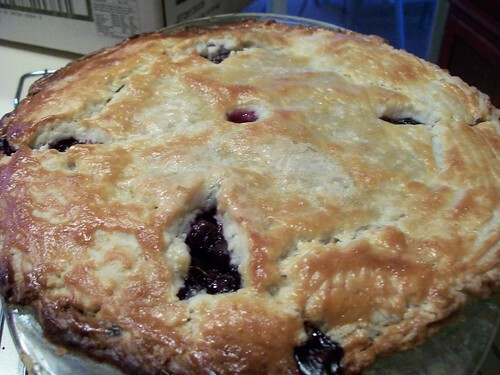 I had bought a 2-quart container of blueberries at Costco earlier, so I had enough berries to fulfill the recipe and gorge myself while I waited the hour for the pie to finish baking. I mixed the ingredients together (as Dorie says, “gently stir”), but my pie filling didn’t look too much like pie filling. It looked like salt and sugar piled below a bunch of berries. It didn’t come together until I started smashing a few berries. “Gently stir” must have a wide variety of interpretations, because you’re going to want to mush some of your berries to get a decent filling. I filled my frozen pie crust with unflavored breadcrumbs and the sugarberry mix. I placed the frozen top atop my pie. It just about fit over the whole thing, which I took as a small victory. With some fork-smashing, I managed to seal the top of the pie (although the “crust” looked pretty dismal). As a result of having to finagle the crust, the pie wasn’t necessarily the prettiest thing in the world. Thankfully, my website had the word “ugly” in the title twice. Paydirt. OH CRUD. Twenty minutes into the hour of baking, my crust was brown and soon-to-burn. Too thin. Way to go, Mike Spoodles. Way to make a pie. I moved the pie up to a higher rack in the oven, and I turned the heat down to the “second thirty-minutes'” temperature early. I tented some tinfoil loosely over the pie, as Dorie recommended. I had no idea what this would do, but I was flying on my feet. I had to use all the instincts I had honed through twenty-three years of microwaving everything I’d ever eaten. Oh dear. I finally swallowed my pride and went to my mother for help, who told me to put the pie back on the bottom (where it is less likely to brown, apparently), and to stop running around screaming like a little ninny. Apparently pie is pie, and pie is good. One of life’s lessons. I crumbled off a lot of the offending crust. The final product? Ugly, of course. The taste? My mom says, “Mmmm! This is good.” She specifically liked the crust. I liked it just fine, too. The fact that it came out tasting like an actual dessert damn near brought a tear to my eye. 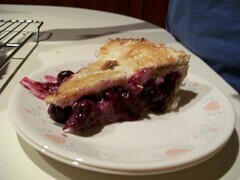 My dad and brother did not eat it, but they probably would have if I had replaced the blueberries with ground beef. A bit of a madcap first week of Tuesdays With Dorie for me, but I can only imagine that things will get smoother from here (they won’t). Here is nutritional information for 1/10th of the pie (which is less than Dorie’s recommended 6-8 servings, but COME ON LOOK AT THOSE CALORIES. Haha.